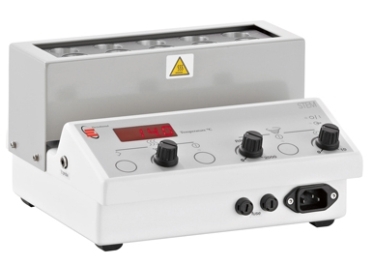 The RS 9000 Heater/Shaker Reaction Station can be used within a robotic workstation or as a stand-alone apparatus in the lab. On a robotic platform, heating and shaking cycles can be controlled by external software or as part of a fully automated system through the RS232/ RS485/ GSIOC ports; for standalone use, there is the additional option of controlling heating and shaking cycles via the user friendly touchscreen. The CTC panel (Capacitance Touch Control) of the touchscreen enables the temperature and shaking speeds to be changed using up/down arrows and the actual values are clearly displayed on a high definition LCD display which has an anti-glare coating. The LCD display is cool blue to be visible in both bright and dim lighting conditions, without deleteriously affecting lightsensitive chemicals. The touchscreen has a laminated toughened glass panel that is chemically resistant to most acids and solvents. The RS9000 operates over a temperature range of ambient 5°C to 150°C. An optional temperature probe can be purchased and plugged into the din socket on the front panel. The RS9000 can handle heavy workloads and give 24 hour continuous operation with uniform agitation of between 100- 600rpm. For stability, the RS9000 has a solid bronze chassis on which the X-Y gyration system is mounted, which is a robust two axis slide plate mechanism. Tapered roller bearings ensure smooth agitation cycles and give accurate control of agitation speed even at low revolutions. Advanced micro-controllers monitor temperature and agitation speed constantly and make the required adjustments as necessary which has been proven to provide many years of reliable service. The RS9000 has a range of different reaction blocks that can be inter-changed to give a choice of both reaction vessel capacities and formats that can be fitted into the same working footprint. If desired, the reaction blocks can also be customised to accept different vessels and tray sizes. The RS9000 has a unique "auto-park" feature which ensures the platform always stops in the same X-Y co-ordinate This allows for automated sampling and additions. The RS9000 has a thermal cut-off that eliminates runaway conditions. The 'Hot block' warning via a highly visible warning display icon alerts you to when the block temperature is above 50°C, even when the apparatus is unplugged from the power supply. The RS9000 can be stopped rapidly in case of emergency by pressing down on the front sliding door; the front display will indicate "Door Open" and immediately stop. Heating and stirring can be reset after stopping by closing the door and pressing the function key zones on the front panel to reactivate. Soft Start Ramping allows controlled build-up to the set speed (from 0 to 10 mins). This feature minimises splashing of vessel contents, wetting of flask closures and fragmentation of specimens.